This is a four-part series examining some of the arguments in the book Creationism: An Australian Perspective (edited by M. Bridgstock and K. Smith)—a publication of the Australian Skeptics. This is an organization affiliated with similar groups overseas, which tests ‘claims of paranormal phenomena’. Many of its members are heavily committed to atheism/evolutionary materialism—see How Religiously Neutral are the Anti-Creationist Organisations? 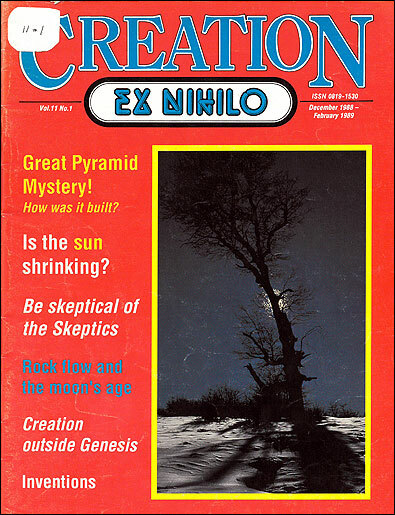 Rather than just keeping to their usual mandate of exposing bogus claims by repeatable scientific testing (with which we could heartily agree), they have chosen to attack biblical Christianity by attacks on creation science. This series deals with a few of the most obvious and easily demonstrated fallacies in the book. The four articles in this series should have been sufficient to cause readers to be very cautious before accepting at face value any argument put forward by the Skeptics. Christians should also be ‘skeptics’ in a sense (small ‘s’) when people claim powers which seem to regularly violate the God-ordained laws of science. They should support the idea of careful scientific testing of such claims (‘examine everything carefully’—1 Thessalonians 5:21). Why does evolution command such devotion? Most leaders of evolutionary thought were strongly atheistic—see A ‘Who’s Who’ of evolutionists. If things have not made themselves naturalistically (which is the ‘bottom line’ for evolution, regardless of which version) then they were made by a transcendent God. Genesis is the only true account of such creation of all things. And if Genesis is true, then so is the fact that we are all in rebellion against our Maker, and require the Blood of the Lamb for reconciliation with Him. Thus, the message of Creation carries with it the message of the Cross, which the Apostle Peter says is an ‘offence’ and a ‘stumbling block’ to many (1 Peter 2:8). But it is the ‘wisdom of God’< to all who believe (Ephesians 3:10). Although many prominent evolutionary fossil experts insist that there are no satisfactory fossils of transitional forms between different kinds of creatures, on page 35 of the Skeptics’ book, the author tries to show that there are. In his article about ‘Gaps in the fossil record’, he neither mentions nor shows a single diagram of any fossil. In fact, much of the article is taken up explaining away the very gaps which he elsewhere seems to deny by saying that ‘the fossil record contains literally thousands of transitional forms’. In spite of many words, the author neither mentions nor shows a single diagram of a fossil showing a true transitional structure—part-limb, part-wing; part-scale, part-feather, for example. This, of course, is for the simple reason that there are none. However, all of this has been so adequately documented—not only by creationist writers such as Dr Duane Gish (Evolution: The Fossils Still Say No) by also by leading evolutionists—that this is not the issue I wish to discuss here. ‘Most significant of all is the fact that scales and feathers are interchangeable. Recent laboratory studies demonstrate that chicken embryos can be induced to transform their developing scales into feather, and their feathers into scales (e.g. Dhouailly, Hardy and Sengel 1980). In their structure and appearance such artificially induced feathers are indistinguishable from natural ones. Indeed, it now seems possible for scientists to transform scales to feathers, and vice versa, almost at will! Similar interchanges between scales and feathers are known to occur spontaneously in wild populations of birds. Does the transformation of scales into feathers require massive genetic engineering? The answer is no. The transformation is triggered by a single chemical—retinoic acid, which is probably better known as vitamin A. One gets the impression that it is a fairly simple matter to transform scales into feathers with the addition of a single chemical. If so it would not be at all difficult to imagine how scales could have evolved into feathers by only a small genetic change. However, common sense shows the huge flaw in this argument. Superbly engineered for lightweight aerodynamic efficiency, the system of interlocking hooks and barbules means that a quick preen with the bill will cause flattened feathers to snap into fully aerodynamic shape again. But note that every structure or organ must be represented by information (written in a chemical alphabet on the long molecule DNA) at the genetic level. Clearly, the information required to code for the construction of a feather is of a substantially different order from that required for a scale. For scales to have evolved into feathers means that a significant amount of genetic information, or specific chemical complexity, has to exist in the bird’s DNA which is not present in that of the reptile. Examine the amazing close-up (below) of the barbules of a feather showing the tiny hooklets and grooves (Magnified 200 times, courtesy of David Menton). At this stage we should be feeling uneasy about the idea that a simple chemical, containing a small amount of ‘information’, could cause such an ordered structure to arise. And here’s the catch, of course. The author himself has already told us that the experiment was done on chicken embryos, which already have the information coding for feather construction. The simple chemical is used as a ‘switch’ or ‘trigger’ during embryonic development. That is, what we are witnessing is the fact that physicochemical manipulation of the developing embryo can cause a developmental pathway, which would normally result in scales, to result in feathers instead. But the information required to construct/assemble the structure of the feather is already there, and is simply being expressed at a different site. Genetically, there has been no evolutionary change—no information has been added to the organism’s ‘blueprint’ which was not already there. So what has been achieved is that feathers have been induced to form in birds—although in locations at which they would not usually form. Equally, interference with the developmental machinery in fruit flies can cause a leg to grow where there would normally be an antenna. Such homoeotic mutations, as they are called, are not strictly analogous to the chicken example, but the point is the same, in that the genetic information for forming a leg was already in the embryo. Growing ectopic, or out of place, fur on mammals, or extra legs on flies or cows, demonstrates nothing about the origin of the information coding for fur or legs. Thus, growing feathers on chickens cannot possibly have any value for the idea of evolution. What if a researcher reported that vitamin A in a reptile embryo caused feathers to form? Now that indeed would be spectacular evidence for evolution. But no serious scientist would expect that such a thing were possible, for the simple reason that it would be a violation of the fundamental principles of entropy/information theory. The reptile does not contain the information for feather construction in its code. Vitamin A contains less ‘information’ in its chemistry than that required to code for a complex feather. The addition of a small amount of unrelated information cannot spontaneously cause a quantum leap towards information which was not there already. Put simply, you cannot get something from nothing—this is why there is no such thing as a perpetual motion machine. Exactly the same principle of science forbids reptile feathers as forbids perpetual motion machines. If a clever genetic engineer were to splice out the information coding for feather construction from a chicken embryo, and splice it into a reptile embryo to cause it to grow feathers, this would confirm the point we are trying to make here—that is, such complex information cannot spontaneously arise—it has to be created or transferred from a preexisting source. And furthermore that an intelligent mind is required to conduct the experiment. See the sequel, The Strange Recurring Case of the Feathered Reptile—a refutation of an evolutionist who tried to answer this article.